Recently, we went to the Steppes Travel Beyond Festival 2017; a festival that encourages us to explore the world on which we live and appreciate all it has to offer. This year the theme of the festival was about plastic pollution and raising awareness of this growing environmental problem. We were privileged enough to speak at this festival and found that there were a lot of enthusiastic children and adults who were extremely interested and shocked about the issue of plastic pollution. Our talk focussed on our campaign, Kids Against Plastic, and offered solutions to reducing single-use plastic from our lives. This was also the theme at the Ocean Panel discussion on Saturday evening between marine biologist Dr Sylivia Earle, free diver Hanli Prinsloo, managing director of Nextek and recycling advocate Edward Kosier, film director (of the film Plastic Oceans) Jo Ruxton and environmental campaigner, Natalie Fee. 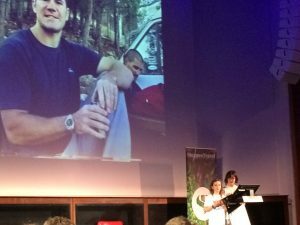 It was an incredibly inspiring evening and we were thrilled to be offered the opportunity to finish it off by doing a short call-to-action about how people in the audience can take inspiration and turn it into action. One of the highlights of the weekend was watching Steve Backshall’s talk. Children and adults flooded into the festival, filling the Royal Geographical Society theatre. Before finding our seats, we stood nervously at the side of the stage, because we had been given the honour of introducing him onto the stage for his talk. My legs were shaking with excitement (and nerves) as we walked onto the stage in front of a full, two-tier audience. He gave a brilliant talk and, like I said in the introduction, he continues to inspire me to want to be an animal TV presenter and conservationist when I am older. As speakers, we were lucky enough to spend time in the Green room, the members’ room at the Royal Geographical Society. Walking up the stairs to this room, you read the names of famous explorers and geographers on the steps and pass through a room with photographs of Shackleton’s expedition to the South Pole. 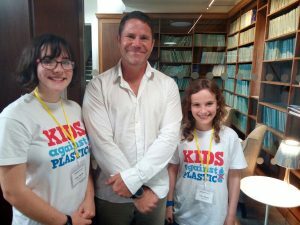 It was in the Green Room that we got to meet some inspirational people, including those on the Ocean Panel, naturalist and TV presenter Nick Baker, Simon Reeves and, of course, Steve Backshall. 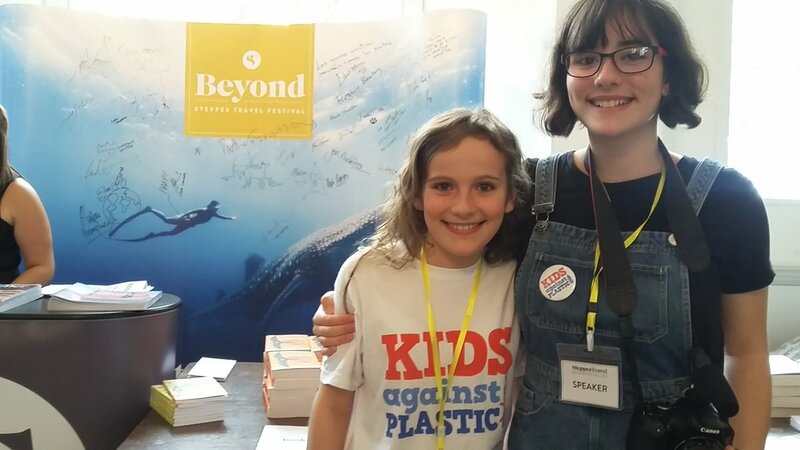 We interviewed lots of the speakers about their experiences with plastic on their travels and their views on how the mammoth issue of single-use plastic can be tackled. This will be made into a short video that will be released soon. This is the message that Justin Waterbridge, the managing director of Steppes told us during his talk and as he addressed the audience at the talks of other speakers. The world is a wonderful place and there is so much to discover but there is also so much that we need to do to keep it wonderful. ‘The greatest threat to our planet is the belief that someone else will save it.’ Robert Swan. So we, the Kids Against Plastic, aren’t waiting around for someone else to save it. The Beyond festival helped us to spread the word and there is also no doubt that this festival will cause many more people to use less plastic and appreciate the planet we live on.